It's that time of year again. SPRINGERS. This is the most desired table fare of all the salmon species. 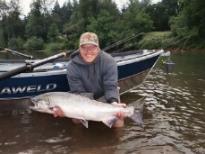 I'll be fishing on the Columbia, Willamette and the Sandy rivers through the month of June, so book your date and come get in on the action. 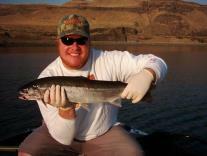 Also, don't forget about Columbia River Salmon fishing at Bouy 10 getting ready to kick off in August. 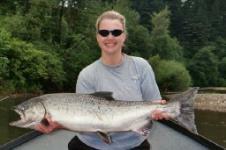 As owner/operator of A "Reel" Premier Guide Service I fish throughout the northwest to ensure you have the best possible day on the water. Using custom Alumaweld boats and only the finest tackle, such as Shimano and G Loomis, you will enjoy a fishing adventure second to none. Being a native Oregonian and fishing the northwest for over 30 years, has given me a vast amount of knowledge in the fishing industry. For the past 7 years, I have guided professionally and I am dedicated to sharing my learned techniques with you as my client. I am committed to earning your respect as one of the hardest working guides you've fished with and look forward to keeping you as a returning customer. I can accommodate large groups for any occasion including corporate events. I can fish up to 6 clients in my boat and many more by coordinating multiple boats with other top Columbia River Fishing Guides. I look forward to the opportunity to show you my dedication to being a part of your best fishing experience.